Spicy mango avocado yogurt dip is NOT your average healthy appetizer! It’s A NEW, TASTY way to eat veggies! 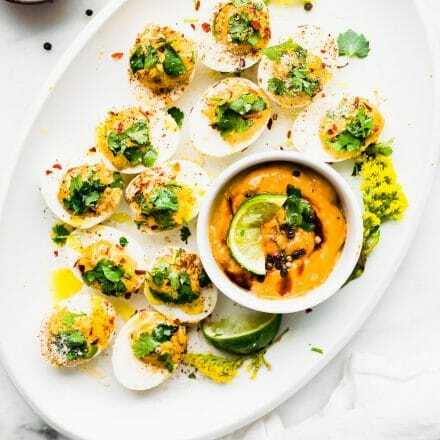 Mango, yogurt, avocado, and a kick of spice from chilis makes this easy snack recipe a protein rich dip! 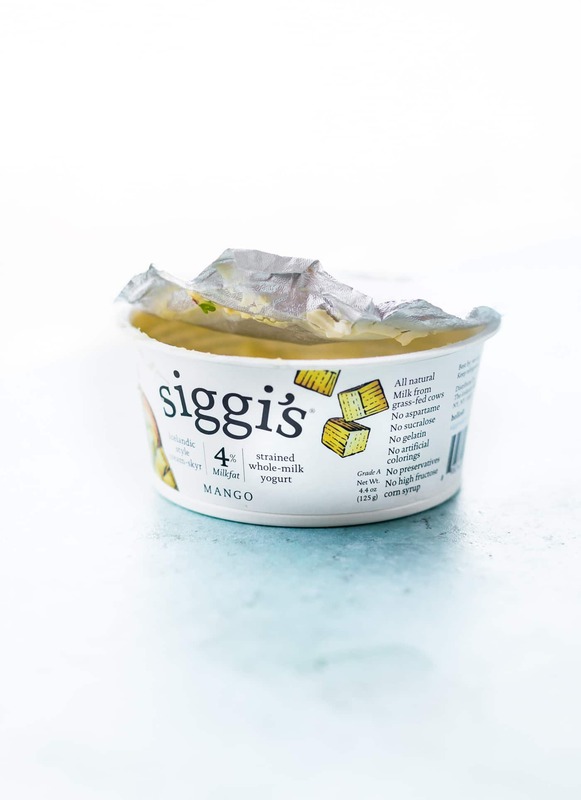 Thanks to siggi’s dairy for partnering with Cotter Crunch on this mango avocado yogurt dip! Now let’s DIVE right in. Cool? 5 words that make my life complete … SPICY MANGO AVOCADO YOGURT DIP! What? You were expecting something else? Haha, probably! But hold up, I have my reasons. You will see, and most likely agree! First, let me ask you if you could describe summer in food groups and food descriptions, what would you say? I’d say cool, refreshing, fruity, creamy, crisp (as in crispy vegetables or salads), spicy, tangy, ZINGY (my new favorite word), snacky, and light! Doesn’t that sound like the perfect summer food to MAKE YOUR LIFE COMPLETE? Yep! 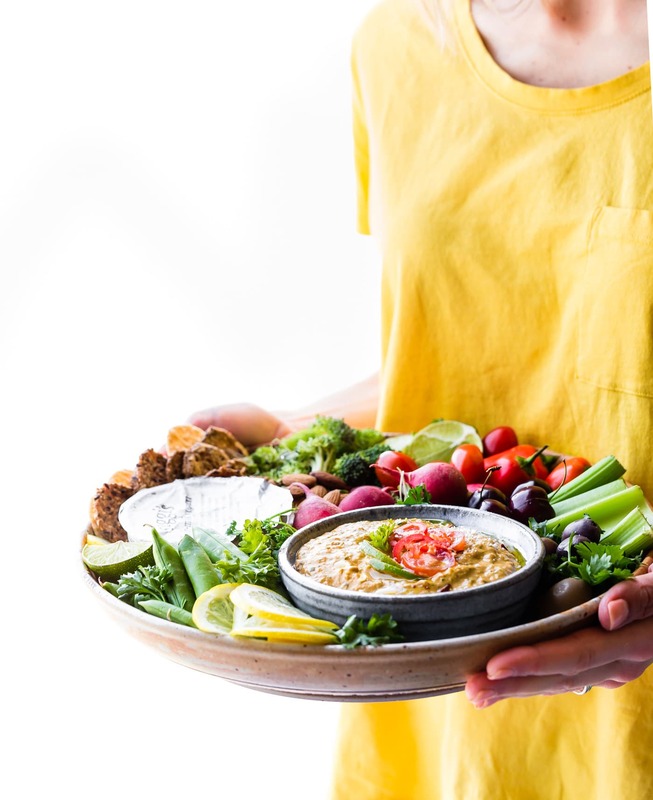 Oh… and what a coincidence, this spicy mango avocado yogurt dip and vegetable/fruit platter just happens to be all those things. Yes, I’m clever. But y’all, it’s true! We have entered into the season of snacking and all things refreshing! I say we embrace it! 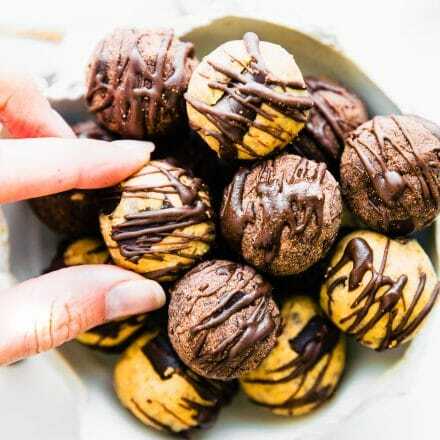 Much like all things in life, we need a season of bite size refreshments. Amen amen! But here’s my dilemma. 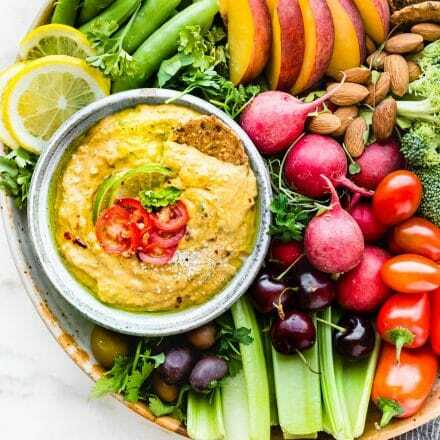 Yes, we snack away at veggies, fruit, and ice cream galore, but what if we were able to turn this snack-athon into a balanced “READY to eat” meatless. Or rather, a mini meal! That way we stay fueled and nourished while playing in that summer sun (okay I really need to get out more). Anyway, this recipe has that covered. You’re welcome! And trust me, you’ll love how easy and… wait for it… REFRESHING it is! Balanced in healthy fats, protein, fiber, and so many nutrients! Ahhh! I hear the summer beach babe Gods shouting “hooooray! ” Kidding, kinda. Actually, I’m more focused on all those busy mamas keeps their kiddos well fueled and hydrated with snacks ALL SUMMER LONG. Yep, this snack is summer on a platter! 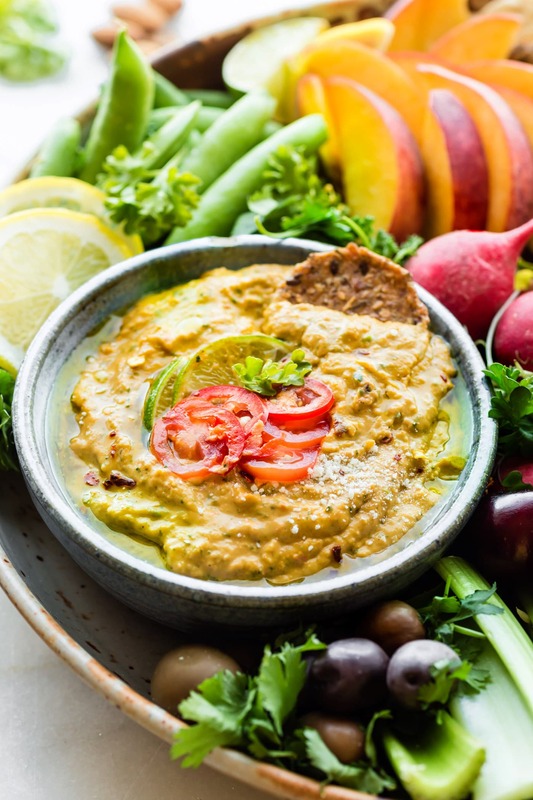 Mango, yogurt, avocado, chili sauce, onion, tomatoes, cilantro, and spices all blended together to make one EPIC dip! The KEY ingredient that gives it that PROTEIN boost is the one and only siggi’s Icelandic yogurt y’all! I’m using siggi’s 4% whole-milk Mango yogurt in this recipe, which makes it extra creamy, naturally sweet, tangy, and nourishing! You can also use siggi’s 4% plain or even their 2 % coconut yogurt. ALL work great to make this creamy yogurt dip! By using siggi’s 2% or 4% yogurt, you get a thicker yogurt dip that is satiating and wholesome. Packed with protein, less added sugar, and made with just real food ingredients, including live cultures (probiotics). See, your bellies really will be happy and full. Um, and did I mention no baking is required. Just a blender or food processor and an extra large dipping bowl to serve it in. Ahh yes, spicy Mango Avocado yogurt dip is so versatile! Pair it with fruit, veggies, gluten free crackers, nuts, olives, etc. Oh, and it pairs well with big appetites, you know… for noshing. Cool? Cool as a cucumber! Alright, let’s dig in. I mean “dip” in. Extra chili pepper slices and lime slices for garnishing. Sliced fruit, vegetables, gluten free crackers, and nuts/olives to serve with. Cut and peel your mango and avocado. Peel your garlic cloves, Dice your tomatoes. 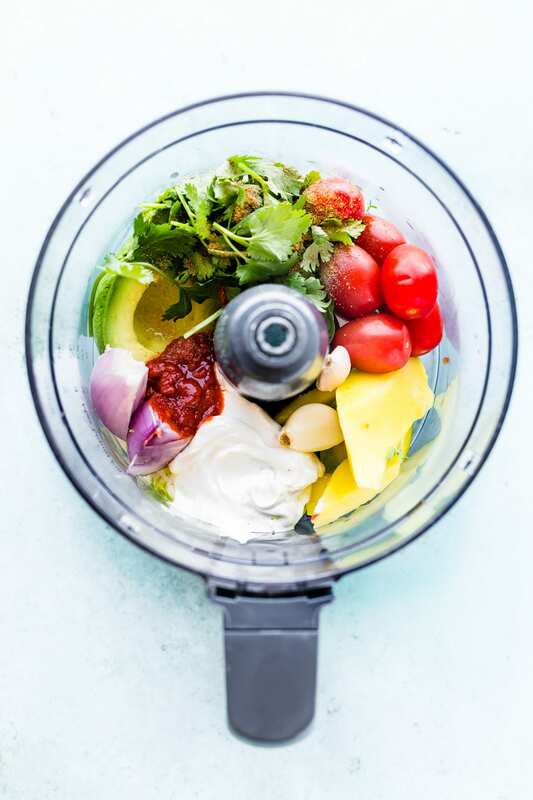 Place your mango, avocado, garlic cloves, onion, tomatoes, cilantro, and siggi’s yogurt in a food processor and blend until all is mixed. Add your spices, chili sauce, and oil, and blend again. Taste and add salt/pepper to your liking. Blend, then stop and scrape sides if needed. Add a dash of lime juice. Blend once more until a creamy thick consistency is formed. Scoop yogurt dip into a small bowl. Arrange on platter with your vegetables, fruit, nuts/olives, etc. Yields 1 cup of dip. Store in Air tight container until ready to serve. Keep in fridge for up to 5-6 days. 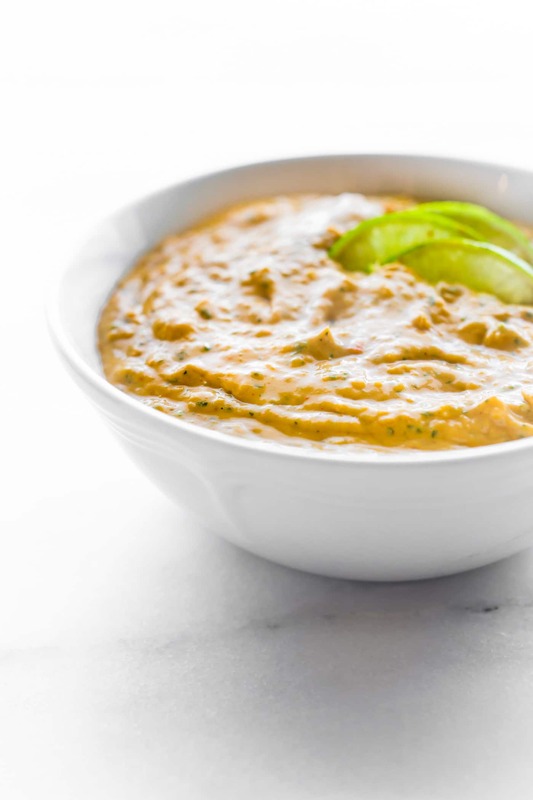 Spicy Mango Avocado Yogurt Dip! A #Healthy protein rich snack platter! @siggisdairy! 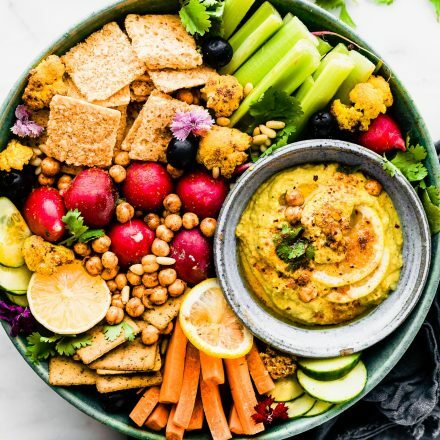 Favorite type of summer snack dip, etc? 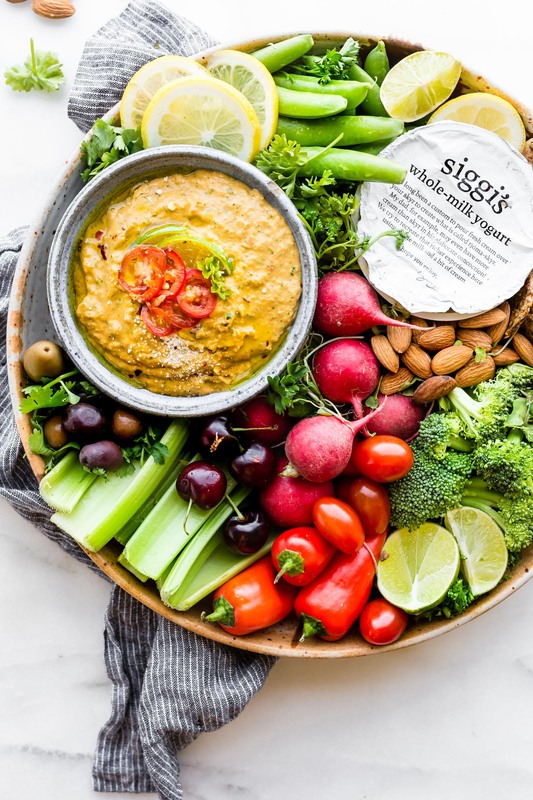 This Spicy mango avocado yogurt dip recipe is sponsored by my friends at siggi’s! Thankful they supply us with such nourishing real food! Keep up with the siggi’s on social media. Facebook, Twitter, Instagram, Pinterest They are full of recipe inspiration! I could love that! I need you for so much recipe testing! haha. And friendship of course! i could drink it. LOL! well… you know. haha! Siggis yogurt is my fave! Love seeing another way to enjoy it! I am 100% making this! 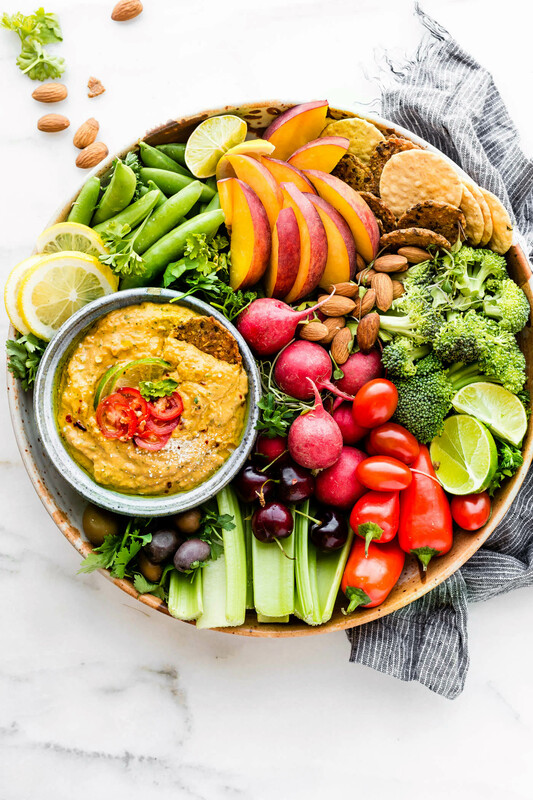 And this veggie bowl is such goals! I love fruit in savory dishes. We eat mango coated in Tajin a lot in SoCal. This dip sound like perfection! I with I could make it and take it with me on a plane… it would be the perfect snack while we’re playing ball in AUSTIN next week! Love that shot of all the goodies that go into this dip. 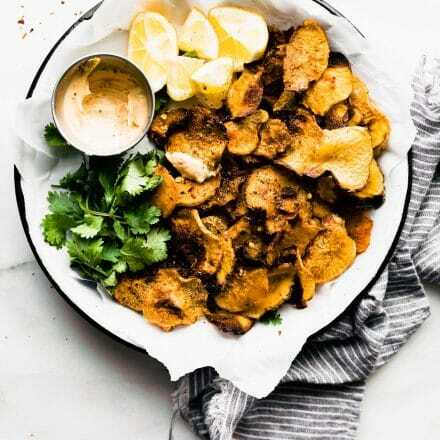 And love the idea of making dinner one big plant-based snack fest. Wonder if a mayo would work in place of the yogurt? Or maybe an unsweetened non-dairy? I would try with a non dairy yogurt first. Keep me posted! Such beautiful colours!! Those flavours would be amazing…pinning!! This looks amazing. You come up with all the very best recipes, I have no idea how you think of so many. haha i don’t know either! I think I would be dipping just about everything in this! How delicious! Um this looks amazing!! 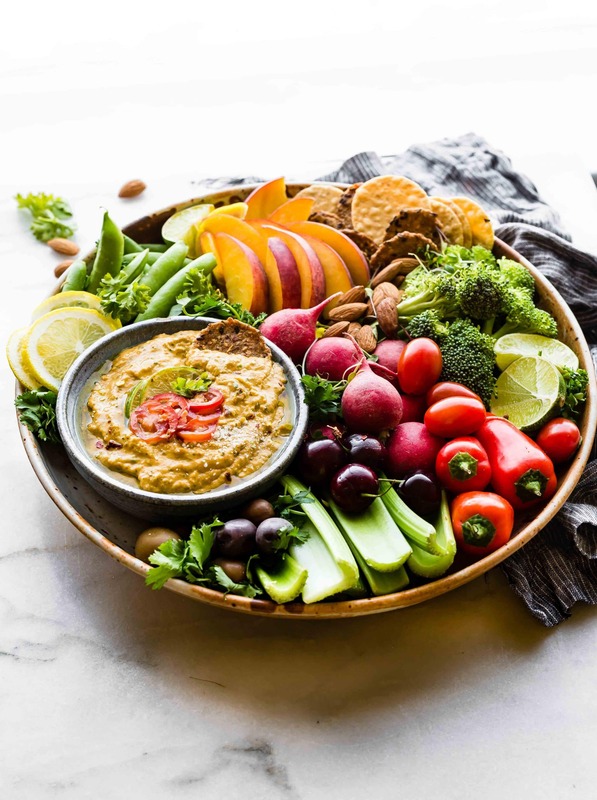 I’m a huuuge fan of raw veggies (I typically eat them plain… yes I’m weird) but this dip looks unreal and I know my husband would devour it! We love avocados as well so I’m pretty sure we’re going to need to try this out asap! Holy YUM! I need to be snacking on this all day long! I could dip just about everything in this! Such a beautiful platter! Love the sounds of the dip, and it’s *almost* too pretty to eat. haha thanks! You must definitely EAT! I can’t wait to dip into this! YUM! What a positively stunning spread! And I love how the veggies are both on the plate and IN the dip! Thanks Alisa! Yes, love all the veggies! Wow it is so creamy and beautiful. I love the colors on that plate of veggies. And I love that you chose such a unique flavor for the dip. You’ve heard of amazeballs…well this is AMAZEBOWL!!! So pretty Lindsay! Lol! I shall name my next cookbooks that. Amazebowls it is! 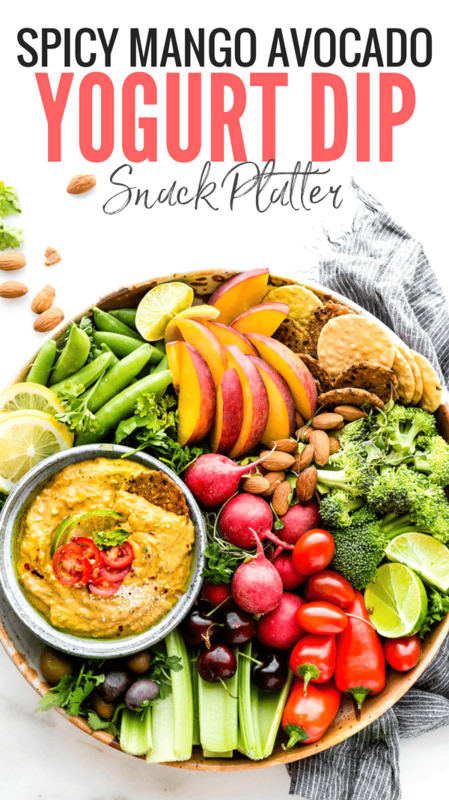 Sounds delicious and I love the fruit and veggie platter you have paired with it! Perfect for any picnic! This is amazing, love the combo and such pretty pictures. Delicious. Pinning. This is perfection! Mango and avocado are my favorites! <3 Your photography is amazing, and I love how you put the bowl together. Everything looks so beautiful! This is just SO gorgeous!!! I absolutely love the fact that this has yogurt!! SO delicious with siggi’s! Hope you’ll try! This sounds so amazing! Bring on the dip! WooHoo!! Go for it Erin! This is so smart! Definitely mini-meal worthy. Or who am I kidding, BIG meal worthy. I could just eat this whole platter and be happy! I don’t know if it’s just me, but every time I visit this blog I have a feeling like this food just gets better and better! Haha well thank you Brian! Mango and avocado are two of my favorite foods. I think I could live solely off of them. And maybe this dip. Holy moly it looks AMAZING. NEED to try this epic dip at our next cookout!! Yum! This looks delicious! Love all the flavors you have packed in there and how you pair it with fruits AND veggies! I’m coming to your next party! Darn I just picked up my husband blueberry and not the mango Siggis otherwise I’d whip this up this weekend! Lindsay, I’ll be honest! As a huge fan of design in particular, I’m tempted whenever I read some of your recipes, but when I look at the photos, this is the decision-point for me!!!! They are absolutely making me hungry! Amazing food photography. Even if it’s something I don’t usually eat, I really wanna try it because of the way it looks! Great job! I did this past weekend!